Calculate maximum theoretical efficiency of a nuclear reactor. Explain how dissipative processes affect the ideal Carnot engine. We know from the second law of thermodynamics that a heat engine cannot be 100% efficient, since there must always be some heat transfer to the environment, which is often called waste heat. How efficient, then, can a heat engine be? This question was answered at a theoretical level in 1824 by a young French engineer, Sadi Carnot (1796–1832), in his study of the then-emerging heat engine technology crucial to the Industrial Revolution. He devised a theoretical cycle, now called the Carnot cycle, which is the most efficient cyclical process possible. The second law of thermodynamics can be restated in terms of the Carnot cycle, and so what Carnot actually discovered was this fundamental law. Any heat engine employing the Carnot cycle is called a Carnot engine. What is crucial to the Carnot cycle—and, in fact, defines it—is that only reversible processes are used. Irreversible processes involve dissipative factors, such as friction and turbulence. This increases heat transfer to the environment and reduces the efficiency of the engine. Obviously, then, reversible processes are superior. A Carnot engine operating between two given temperatures has the greatest possible efficiency of any heat engine operating between these two temperatures. Furthermore, all engines employing only reversible processes have this same maximum efficiency when operating between the same given temperatures. Figure 2 shows the diagram for a Carnot cycle. The cycle comprises two isothermal and two adiabatic processes. Recall that both isothermal and adiabatic processes are, in principle, reversible. where and are in kelvins (or any other absolute temperature scale). No real heat engine can do as well as the Carnot efficiency—an actual efficiency of about 0.7 of this maximum is usually the best that can be accomplished. But the ideal Carnot engine, like the drinking bird above, while a fascinating novelty, has zero power. This makes it unrealistic for any applications. Carnot’s interesting result implies that 100% efficiency would be possible only if —that is, only if the cold reservoir were at absolute zero, a practical and theoretical impossibility. But the physical implication is this—the only way to have all heat transfer go into doing work is to remove all thermal energy, and this requires a cold reservoir at absolute zero. It is also apparent that the greatest efficiencies are obtained when the ratio is as small as possible. Just as discussed for the Otto cycle in the previous section, this means that efficiency is greatest for the highest possible temperature of the hot reservoir and lowest possible temperature of the cold reservoir. (This setup increases the area inside the closed loop on the diagram; also, it seems reasonable that the greater the temperature difference, the easier it is to divert the heat transfer to work.) The actual reservoir temperatures of a heat engine are usually related to the type of heat source and the temperature of the environment into which heat transfer occurs. Consider the following example. Figure 2. PV diagram for a Carnot cycle, employing only reversible isothermal and adiabatic processes. 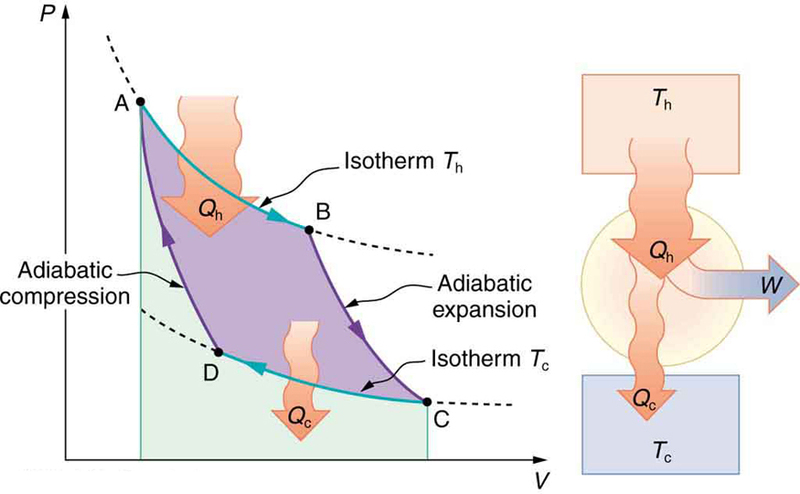 Heat transfer Qh occurs into the working substance during the isothermal path AB, which takes place at constant temperature Th. Heat transfer Qc occurs out of the working substance during the isothermal path CD, which takes place at constant temperature Tc. The net work output W equals the area inside the path ABCDA. Also shown is a schematic of a Carnot engine operating between hot and cold reservoirs at temperatures Th and Tc. Any heat engine using reversible processes and operating between these two temperatures will have the same maximum efficiency as the Carnot engine. 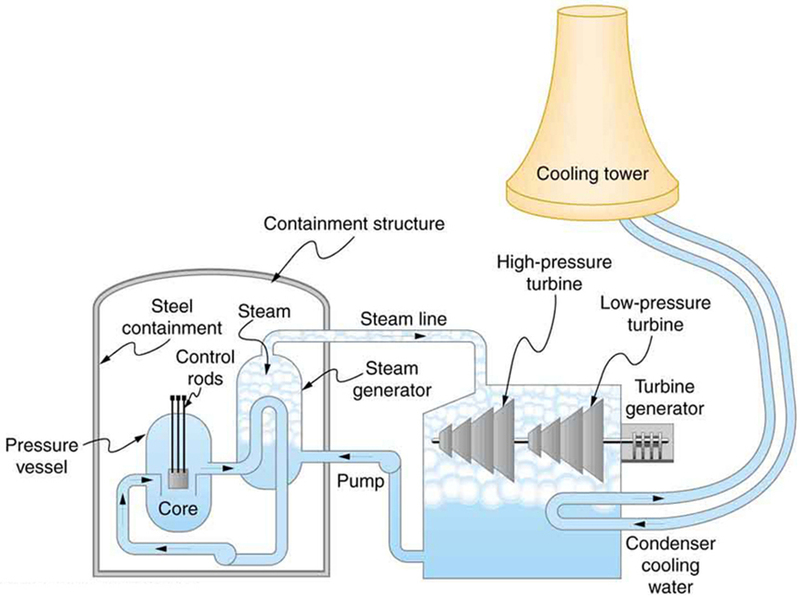 A nuclear power reactor has pressurized water at (Higher temperatures are theoretically possible but practically not, due to limitations with materials used in the reactor.) Heat transfer from this water is a complex process (see Figure 3). Steam, produced in the steam generator, is used to drive the turbine-generators. Eventually the steam is condensed to water at and then heated again to start the cycle over. Calculate the maximum theoretical efficiency for a heat engine operating between these two temperatures. Since temperatures are given for the hot and cold reservoirs of this heat engine, can be used to calculate the Carnot (maximum theoretical) efficiency. Those temperatures must first be converted to kelvins. A typical nuclear power station’s actual efficiency is about 35%, a little better than 0.7 times the maximum possible value, a tribute to superior engineering. Electrical power stations fired by coal, oil, and natural gas have greater actual efficiencies (about 42%), because their boilers can reach higher temperatures and pressures. The cold reservoir temperature in any of these power stations is limited by the local environment. 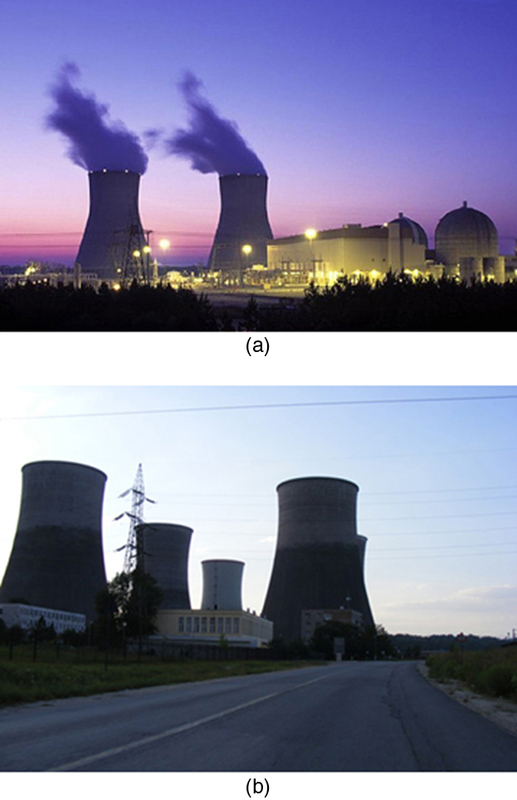 Figure 4 shows (a) the exterior of a nuclear power station and (b) the exterior of a coal-fired power station. Both have cooling towers into which water from the condenser enters the tower near the top and is sprayed downward, cooled by evaporation. Since all real processes are irreversible, the actual efficiency of a heat engine can never be as great as that of a Carnot engine, as illustrated in Figure 5(a). Even with the best heat engine possible, there are always dissipative processes in peripheral equipment, such as electrical transformers or car transmissions. These further reduce the overall efficiency by converting some of the engine’s work output back into heat transfer, as shown in Figure 5(b). Figure 5. Real heat engines are less efficient than Carnot engines. (a) Real engines use irreversible processes, reducing the heat transfer to work. Solid lines represent the actual process; the dashed lines are what a Carnot engine would do between the same two reservoirs. 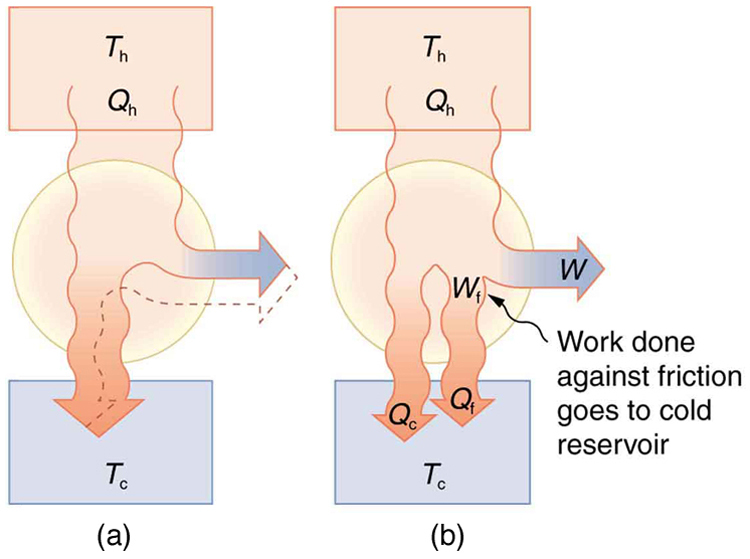 (b) Friction and other dissipative processes in the output mechanisms of a heat engine convert some of its work output into heat transfer to the environment. The Carnot cycle is a theoretical cycle that is the most efficient cyclical process possible. Any engine using the Carnot cycle, which uses only reversible processes (adiabatic and isothermal), is known as a Carnot engine. Any engine that uses the Carnot cycle enjoys the maximum theoretical efficiency. While Carnot engines are ideal engines, in reality, no engine achieves Carnot’s theoretical maximum efficiency, since dissipative processes, such as friction, play a role. Carnot cycles without heat loss may be possible at absolute zero, but this has never been seen in nature. 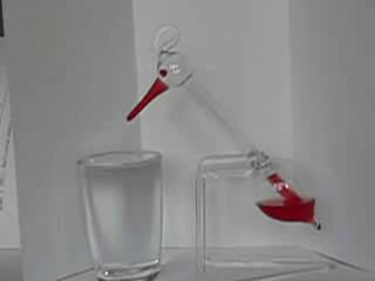 1: Think about the drinking bird at the beginning of this section (Figure 1). Although the bird enjoys the theoretical maximum efficiency possible, if left to its own devices over time, the bird will cease “drinking.” What are some of the dissipative processes that might cause the bird’s motion to cease? 2: Can improved engineering and materials be employed in heat engines to reduce heat transfer into the environment? Can they eliminate heat transfer into the environment entirely? 3: Does the second law of thermodynamics alter the conservation of energy principle? 2: A gas-cooled nuclear reactor operates between hot and cold reservoir temperatures of and (a) What is the maximum efficiency of a heat engine operating between these temperatures? (b) Find the ratio of this efficiency to the Carnot efficiency of a standard nuclear reactor (found in Example 1). 3: (a) What is the hot reservoir temperature of a Carnot engine that has an efficiency of 42.0% and a cold reservoir temperature of (b) What must the hot reservoir temperature be for a real heat engine that achieves 0.700 of the maximum efficiency, but still has an efficiency of 42.0% (and a cold reservoir at )? (c) Does your answer imply practical limits to the efficiency of car gasoline engines? 5: Practical steam engines utilize steam, which is later exhausted at (a) What is the maximum efficiency that such a heat engine can have? (b) Since steam is still quite hot, a second steam engine is sometimes operated using the exhaust of the first. What is the maximum efficiency of the second engine if its exhaust has a temperature of (c) What is the overall efficiency of the two engines? (d) Show that this is the same efficiency as a single Carnot engine operating between and Explicitly show how you follow the steps in the Chapter 15.5 Problem-Solving Strategies for Thermodynamics. 7: Would you be willing to financially back an inventor who is marketing a device that she claims has 25 kJ of heat transfer at 600 K, has heat transfer to the environment at 300 K, and does 12 kJ of work? Explain your answer. (a) Suppose you want to design a steam engine that has heat transfer to the environment at and has a Carnot efficiency of 0.800. What temperature of hot steam must you use? (b) What is unreasonable about the temperature? (c) Which premise is unreasonable? Calculate the cold reservoir temperature of a steam engine that uses hot steam at and has a Carnot efficiency of 0.700. (b) What is unreasonable about the temperature? (c) Which premise is unreasonable? (c)Yes, since automobiles engines cannot get too hot without overheating, their efficiency is limited. The heat transfer to the cold reservoir is so the efficiency is The Carnot efficiency is The actual efficiency is 96% of the Carnot efficiency, which is much higher than the best-ever achieved of about 70%, so her scheme is likely to be fraudulent. (b) The temperature is too cold for the output of a steam engine (the local environment). It is below the freezing point of water. (c) The assumed efficiency is too high. 15.4 Carnot’s Perfect Heat Engine: The Second Law of Thermodynamics Restated by OpenStax is licensed under a Creative Commons Attribution 4.0 International License, except where otherwise noted.